Bike day – loose agenda here in Florence but hoping to cover more ground by renting some bikes. Goal for the day – do not get hit by a car or smack into someone trying to go to work. You may think that is funny, but tight narrow streets, minimal compliance with red lights or stop signs, and suggestions of one way all make for interesting traveling even on two feet. Breakfast is pizza – yeah, yeah I know. But it is the most glorious kind of pizza you have ever seen. Crust so fresh it was made a few hours ago, vegetables sliced in thin long strip, olive oil. 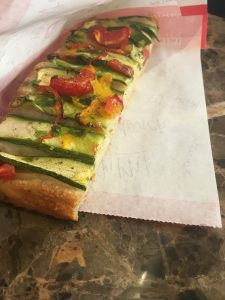 Who would think pizza with no cheese and just veggies could make my heart so happy. Of course I could not leave without an apple pastry as well, but who is counting. Mariah finds some beads for a friend, I buy some strawberries and immediately start eating them, and wandered around looking at furniture and wondering how to ship it to my house. Books in Italian, colorful plates and glassware, it is more than enough to fill my entire house. Not good when my goal is to reduce the things in our home, not to add more. We bike across the river and head uphill into another part of the city. The higher we get, the better the view. At one point I had to stop, just too much in the heat. 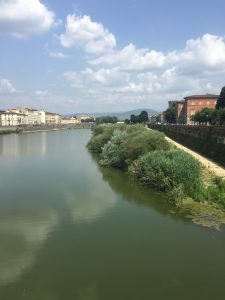 We were trying to find the Michelangelo Park and got a bit lost, and when we did find the area, we were not allowed to bring in our bikes and it was pricey to get in – a bummer, but that meant more exploring. During this adventure I breathed in a bit and realized that last year at this time I was just starting to be able to move a bit more. I could not easily get off the floor, and pain was a constant reminder of how far I had fallen down. 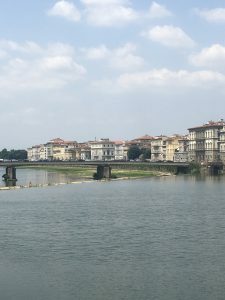 Today, I am biking across Florence, tired at times, and yes the pain is still with me, but I am doing what I want, when I want. What a difference a year makes. And what a difference attitude makes. I am so aware that the happiest people are not those with the most money, the most stuff, or the biggest crows around them. They are the people that find happiness wherever they go, they just choose to be happy. I want to be that person, and vowed at my lowest moments to seek her out. I find that she is here within me, these days more often than not, and that being true to myself, listening to others, and finding small things every day that make it special lead to that promise. It is easy to get buried under things – I know. I have been there so much in the past. I am glad that I have stepped out of it, even after so much hardship. It is possible, just hard. Cancer diagnoses, the passing away of others around you, worrying about return of an illness can make days full of fear. Fearful days are hard days to live through, and I often asked myself is that really how I want to live anyway? I control what I can, and that is my attitude. So cancer can come, but I am still happy. I am still me. I am still having a great day today. And probably will tomorrow as well. Gelato has more flavors than I will ever be able to try while here for only 7 days. Leather goods are everywhere – how many leather purses done one girl need? A fish sandwich from a food truck by the river is as delicious as the spaghetti and seafood pasta I had last night. Just a different environment. Atmosphere and company make or break any moment.